Chewing gum magnate William Wrigley Jr.’s twin interests in baseball and Catalina Island – he bought Catalina in 1919 and gained a controlling interest in the Chicago Cubs in 1921 – dovetailed nicely when he made the decision to have the Cubs train on Catalina starting in 1921. 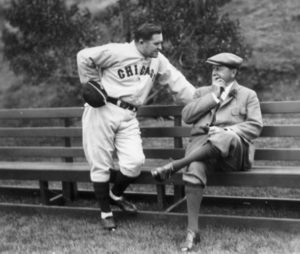 Chicago Cubs Manager Joe McCarthy and William Wrigley, Jr. on Catalina Island during Cubs spring training. SS Catalina and SS Avalon docked in Avalon, after completing the 2-hour voyage from Los Angeles (San Pedro), during the late 1940s. The SS Catalina and SS Avalon operated together from 1920 into the early 1950s — except for World War 2 – with service from Los Angeles to Catalina Island. The Catalina continued running during the summer months into the mid-1970s. The two steamers carried millions of passengers between San Pedro, California, and Avalon, Catalina on the 2-hour crossing. 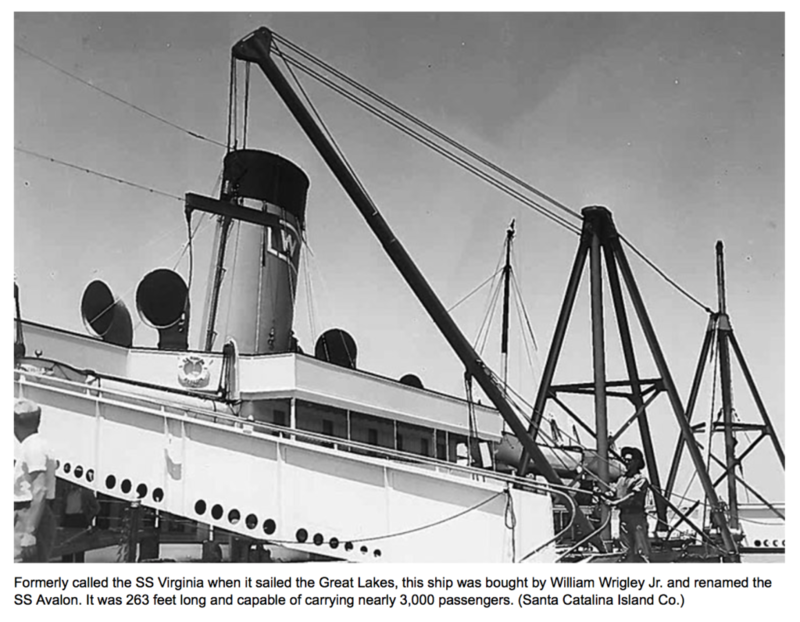 The SS CATALINA was built at the cost of $1 million by Catalina Island owner and chewing gum mogul William Wrigley; the SS Catalina plied the ocean between Wilmington and Avalon daily between 1924 and 1975. Wrigley moved the Chicago Cub’s spring training to Catalina Island in 1921. With a ballpark built for them, the Cubs would travel to the island for spring training from 1921-41 and then 1946-51. Along with a 26-mile ocean voyage, a $2.25 round-trip ticket offered 2,200 passengers big-band orchestra music for dancing, children’s entertainment by clowns and magicians, and adult amenities such as leather settees and drinks from a shipboard bar. Smaller, faster ferries connecting the mainland and the island eventually spelled doom for the colossal steamship, known for its crisp white paint job and deep, the melodious horn that announced its departure. SS Catalina leaving Los Angeles and arriving in Avalon during the 1950s. The SS Catalina’s arrival in Avalon would be heralded by circling speedboats. Children would dive into the water for coins tossed over the rail by passengers as island townspeople sang to passengers walking down the 25-foot gangplanks. The SS Catalina arriving in Avalon – 1970s… and the SS Catalina and SS Avalon docked in Avalon during the late 1940s. “They were probably poor kids trying to make a buck,” former passenger Dorothy Weil of Bel-Air recalled. Although she was too young to drink at the ship’s bar, there was dancing to its orchestra — an unforgettable experience for a teenager in the 1940s. During World War II, the 1,766-ton vessel with its twin 2,000-horsepower engines and football-field-size steel decks was used as a military transport. It carried 820,199 troops around San Francisco Bay before being returned to Los Angeles. 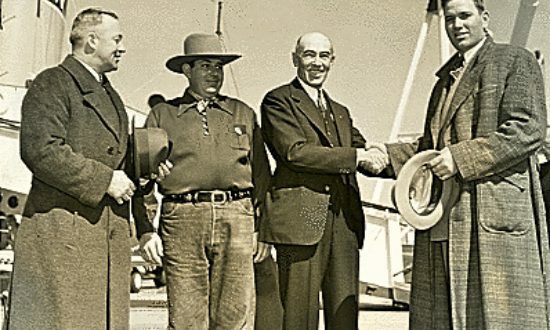 As it continued its island runs, the ocean cruise-like ship was designated a Los Angeles historical, cultural landmark and a state historic landmark and placed on the National Register of Historic Places. The SS Catalina is now nothing but a memory. She was scrapped in 2009 after rotting for 12 years in Ensenada Harbor. Preservation efforts in the 1990s failed after endless financial problems and legal actions. A three-decade campaign to preserve the once-proud steamship ended failed. 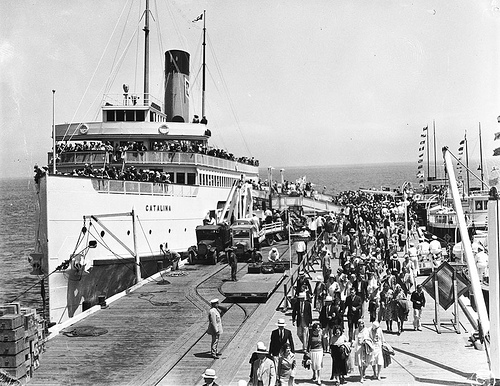 SS Catalina is arriving in Avalon during the 1920s.